Asia Society Texas Center’s popular, family-friendly Night Market returns for a fall evening, filled with activities, exhibitions, food trucks, local vendors, live music, and more. Admission The event is free and there’s no cover to visit the exhibit, explore the market, and enjoy the entertainment. Click here for more information or updates. Sip aperitivo cocktails while munching on hors-d'oeuvres and gourmet pizza when Southside Community Garden hosts an evening of Cultivated Cocktails. During the event, three mixologists will craft unique cocktails with an Italian twist using fresh ingredients, with one winner named at the end of the night. Admission Tickets are $75. Click here for more information. After a three-year delay, local musicians Buxton are celebrating the release of Stay Out Late. The Americana sounds fans are familiar with have begun to evolve along with the evocative songwriting of frontman Sergio Trevino. Admission Tickets range from $18 to $256. Insomnia Gallery hosts the 12 Annual Monster Show, an art exhibition that features drawings of monsters by local artists. There will be beer and food trucks on site. Admission No cover. Click here for more information. Have a laugh when actor and comedian Kevin Hart brings his 2-night Irresponsible Tour to the Toyota Center. Admission Tickets start at $49.50, but you may find cheaper or better seats in TicketNetwork's online resale market. Splendid China XIII will feature new choreography in this international collaboration between dancers from China’s top companies and Houston’s Dance of Asian America. Admission Free to attend. Click here for more information. Dance the night away at a Brit-inspired bash that celebrates the museum's Tudors to Windsors: British Royal Portraits from Holbein to Warhol exhibition, with DJs, drinks, and an exclusive access to the exhibition. Admission Tickets are $22 for members and $25 for nonmembers. Click here for more information. Vibe out to the sounds of the experimental rock band, This Will Destroy You with opener Steve Hauschildt at White Oak Music Hall. Admission Tickets are $15. Click here for more information. Head to Smart Financial Centre for a country concert when Cole Swindell brings his "Reason To Drink... Another" tour to Houston. Dustin Lynch opens the show. Admission Tickets start at $39.75, but you may find cheaper or better seats on the TicketNetwork resale marketplace. 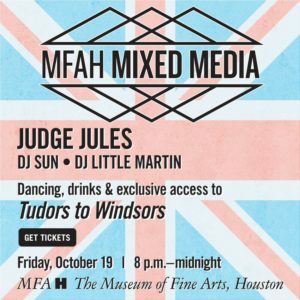 Put on your crown jewels and fly the Union Jack for a British celebration at the late-night MFAH Mixed Media. MFAH Mixed Media goes across the pond for a Brit-inspired bash that celebrates Tudors to Windsors: British Royal Portraits from Holbein to Warhol with fun that goes late into the night, including exclusive access to the new exhibition. Groove to '60s surf rock, soul music, pop and more at the Halloween edition of Shakin' All Over '60s Dance Party. Admission No cover for over 21. $5 for 18 and up. Click here for more information.